I didn’t say that. Jack Jacobs did. But Jack has tastebuds I implicitly trust so I knew I had to check the place out. Jack also said, “When it comes to Mexican beef, there’s no better cut than arrachera.” That I already agreed with. As most women will tell you, men have meaningful opinions about very few things. One of those few things, however, is definitely red meat. So I thought why not assemble a bunch of guys. A committee. The gentlemen who lunch. 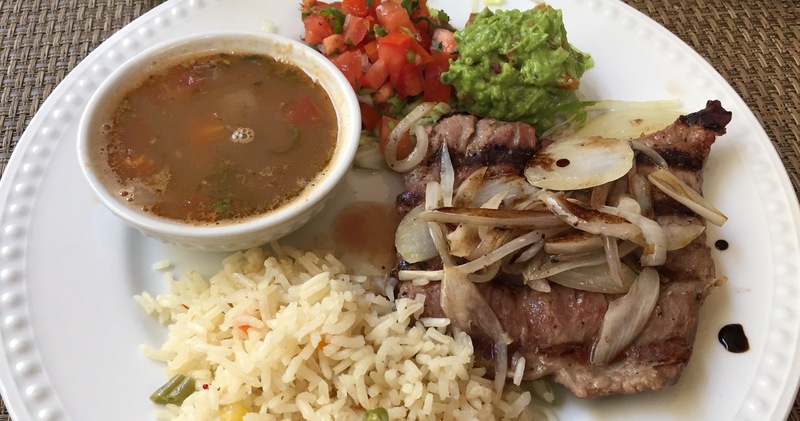 We’d decide together if this San Miguel restaurant really had the best arrachera in town. But first a little about that word arrachera. The word doesn’t appear anywhere in the Diccionario del Español Usual en México. It’s nowhere to be found in the “bible”, Diane Kennedy’s Essential Cuisines of Mexico. I don’t even remember arrachera existing when I first came to Mexico. The first time I recall seeing the word was in 2004, on the menu at Casa Payo on Zacateros here in San Miguel. I didn’t know exactly what cut of meat I was eating but I knew it was love at first bite. Going through my “library” of Mexican cookbooks, I did find some that include the word arrachera but here comes the other mystery about this cut of beef. About half the books say arrachera is a skirt steak. About half the books say it’s a flank steak. None of them say it could be either cut. 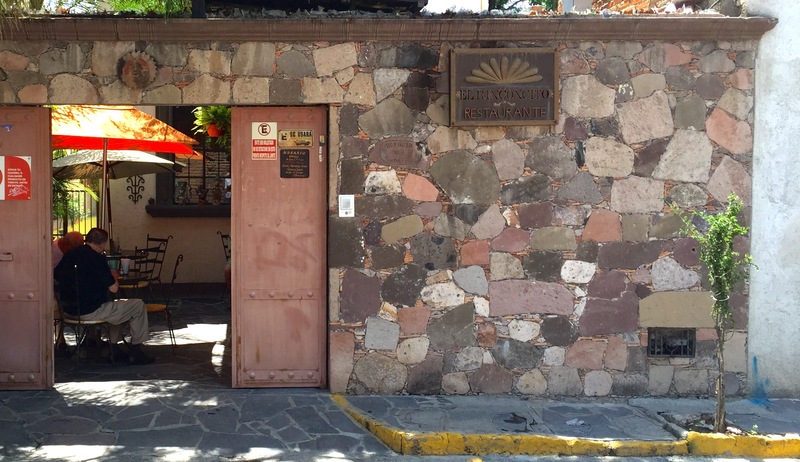 The restaurant that Jack Jacobs says has “the best arrachera in San Miguel de Allende” uses a skirt steak for their arrachera. The first time I was in that restaurant was also in 2004. For a restaurant to even still be around 12 years later, it must be doing something very well, it must be serving something very good. The restaurant is called El Rinconcito. If you live in Colonia San Antonio, I’m guessing you know the place and you’ve probably eaten there. If you live anywhere else in San Miguel, you may have never heard of the place and you almost definitely haven’t eaten there. Which is a shame. El Rinconcito was opened by a young couple way back in the 20th Century. To an old guy like me, Miguel and Mercedes Gomez still look like a very young couple and, though they’ve added a nine-year-old daughter, nothing much seems to have changed. They’re certainly as gracious and as charming as the first time I walked into the restaurant. 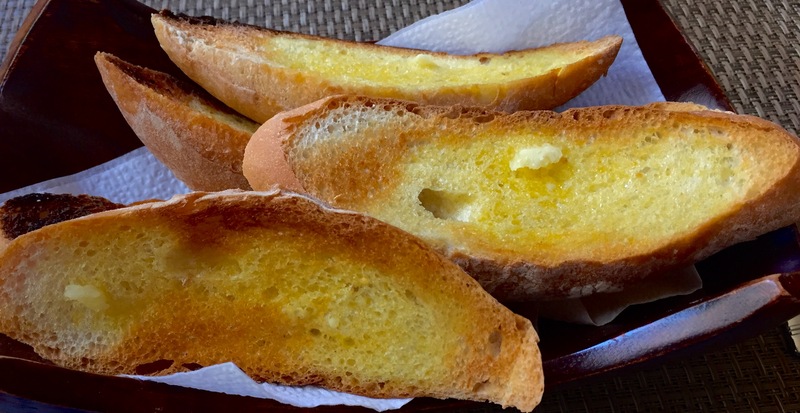 This time, when I walked into the restaurant and sat down at our table, bread arrived. Now normally, if I’m having steak for lunch or dinner, I don’t want bread. Unless, of course, it’s garlic bread. Then I lose control of my arm and it has the reach of an NBA center. The bolillos were crispy on the outside, spongy on the inside. Nice. Before we moved to the main event of the lunch, there was a preliminary. 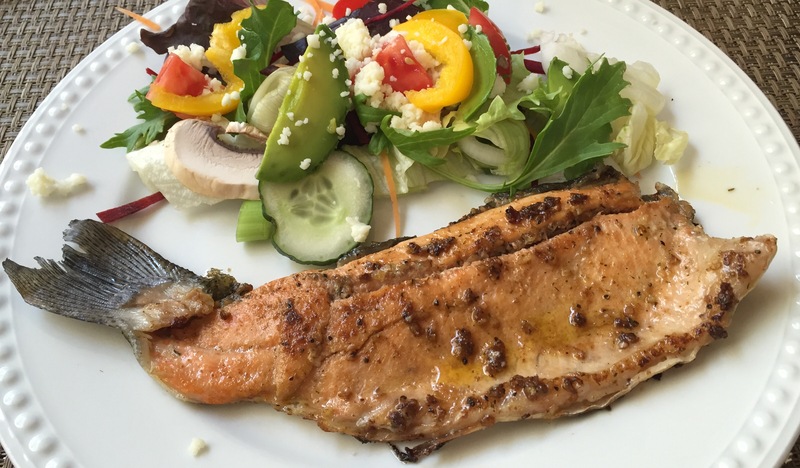 El Rinconcito is one of the few San Miguel restaurants to serve trout and I asked Mercedes if she’d do some half orders with salad. The fish was perfectly cooked (which means not overcooked), nicely spiced, and served with the crispy skin on. The accompanying salad was a welcome change from most Mexican salads. It was one of those everything but the kitchen sink salads with every forkful delivering a different flavor. Oaxacan cheese was the snow on the mountain top. The surf was a success. And, though there aren’t a lot of contenders for the crown in San Miguel, I’d give the trout title to El Rinconcito. But what about the turf? Whether you use skirt or flank for arrachera, in my opinion, it must be marinated. And, in my opinion, the marinating is what separates a good arrachera from a great arrachera. You may have tried those supermarket arracheras, the ones that come in plastic bags, swimming in their marinade. I’ve tried them but I never will again. Too much time in the marinade means they taste only of marinade. Fine if you want the taste of soy sauce or fruit juice. But I want the taste of beef. 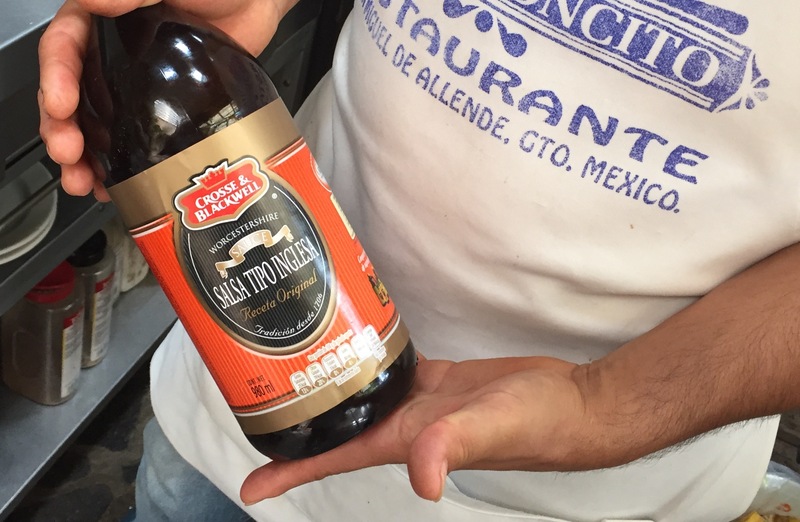 Miguel Gomez marinates his arrachera for only one night. There are a number of ingredients in his marinade but there’s one that Miguel feels is essential. He calls it salsa tipo Inglesa. I call it Worcestershire sauce. And I agree there’s no better way to bring taste and tenderness to beef. El Rinconito’s arrachera is about 150 grams in weight and a little over a centimetre in thickness. It’s not easy to cook a steak that thin. A few seconds one way and it’s rare. A few seconds the other way and it’s toast. Our arrachera came exactly as an arrachera should be. Miguel had striped the outside with sear marks on the charcoal grill and in the middle it was perfectly pink. On the side was rice with some chopped veggies, good sized mounds of pico de gallo and guacamole, a bowl of soupy beans with tomatoes and peppers. On top were some lightly grilled onions. I watched the gentlemen give the arrachera the once over. I watched them pick up their knives and forks. I watched them make their first penetration into the flesh. Ohoh! A couple of them were slicing the wrong way. Not unusual for guys who’ve spent most of their lives with filets, ribeyes and striploins. Should I tell them how important it is to cut arrachera against the grain? Would I like some guy telling me how to eat my food? I didn’t say anything. But, when I saw some strips left on their plate, I did regret it. It was time for the inevitable question. 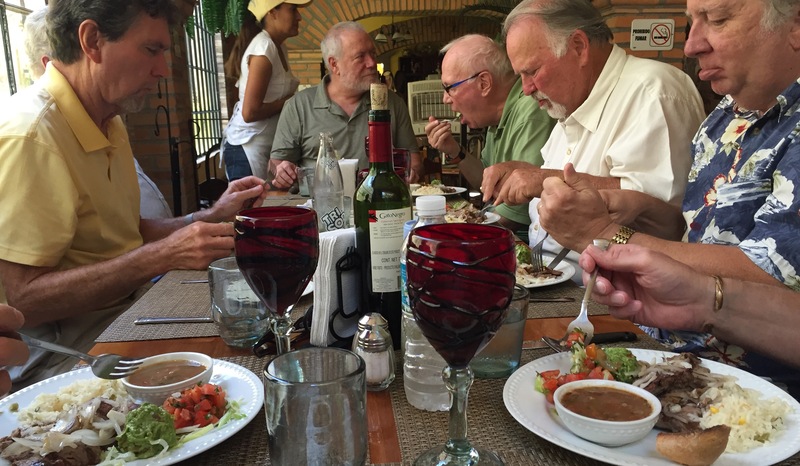 “Was this the best arrachera in San Miguel de Allende?”, I asked the guys? My question was met with silence. I asked it again. Finally Will Brien spoke up saying he thought Costco’s was better. But we disqualified Will and Costco as it’s not in San Miguel and not a restaurant. Stan Jones put in his vote for Ole! Ole! But seeing their old location on Reloj has been closed for a couple of years and Stan hadn’t yet checked out their new space, that was ruled out as well. Finally Jack Jacobs reiterated his vote for El Rinconcito, I seconded it, and the rest of the guys were silent. And if silence is golden, El Rinconcito had just won the gold medal. There was another good reason why El Rinconcito received my vote. It’s what their menu says about the dish. Beside the description it reads 135.00. 135 pesos, less than eight U.S. dollars, is a very delicious price for a steak lunch. El Rinconcito is located at Refugio Norte #7 in San Miguel de Allende, Mexico. They are open from 12:30 pm to 9:00 pm, Monday and Wednesday to Saturday, 1:00 pm to 7:00 pm Sunday. Where oh where is the “new” Ole Ole located? I hear it’s on Calzada De La Aurora but I haven’t checked it out yet. I am glad you gave this little gem the try. When I go to most restaurants in SMA I know what I am going to order. At Rinconcito I never do. They have combination plates to die for. Mercedes and Miguel make you feel like you are a guest in their house. Closed on Tuesday. Best baseball caps too. Hurrah. Another positive review and support for a “neighborhood gem”. And Miguel and Mercedes (and their family) are neighborhood gems who operate a restaurant with grace and skill. Always a pleasure! You must try the flan……the best in SMA!!!!! We just moved from living about 3 blocks up the hill on San Jorge. Love this family and have enjoyed their food for years. Where is Ole! Ole!’s Current location? I was told by owner of the tienda next door to their former location that they had gone out of business. I’m happy to learn that they’re still around. I was told they had opened on Calzada De La Aurora but I went down as far as the bridge yesterday and couldn’t see any trace. SO happy to hear Ole Ole is still in business! If you find them please report to us. So, so good! El Rinconcito’s menu is Excellent… top to bottom. 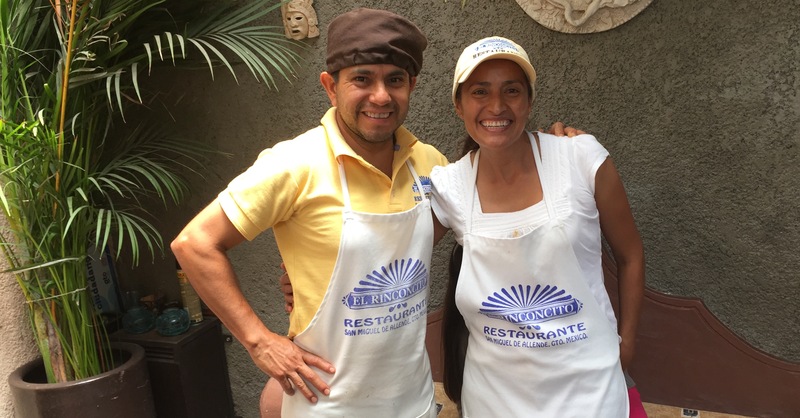 Mercedes and Miguel keep the cleanest restaurant in San Miguel. Should that be Refugio Sur? I’m pretty sure but not absolutely sure it’s Norte. We have been eating at Rinconcito for many years and I always have the arrechera! Maybe there are other places just as good but why give up a sure thing! We will be arriving in SMA in a few days for our winter stay and our first dinner will be at Rinconcito. We look forward to seeing Miguel, Mercedes, and their sweet daughter again. 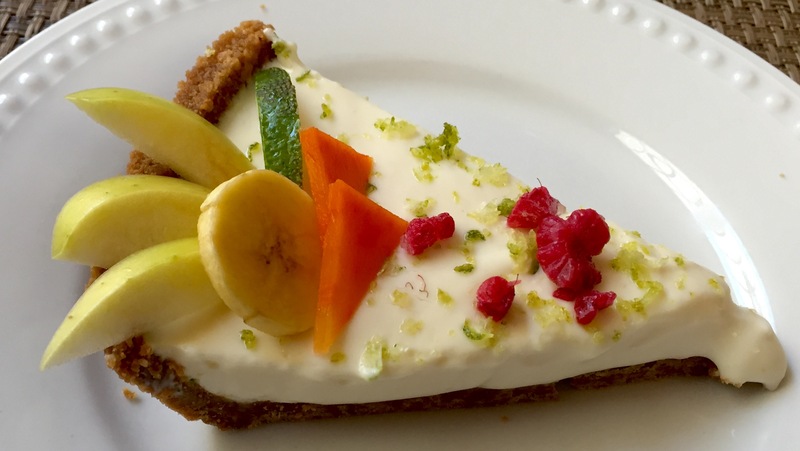 And yes, the key lime pie is also delish. Friends have also praised their spinach quesadilla and the stuffed shrimp. Don’t know if you’ve written more about Ole Ole but it reopened in the same location it was previously on Loreto. Have been several times and happy to say they fill up quickly. Same delicious food! So happy to have them back!